Lace sleeves, a demure neckline, a full skirt and a relatively modest train. After months of speculation, the dress – somewhat unexpectedly given Kate’s usual preference for safe Sloaney clothes – smashed expectations and scored an immediate fashion homerun. Designed by Sarah Burton, the creative director at British label Alexander McQueen, it successfully blended modernity and tradition – a sartorial feat that royalists hope the couple will match in finally bringing the monarchy up to date. 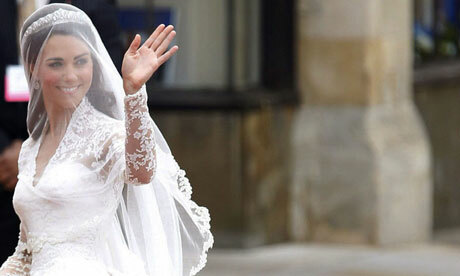 With its elegant silhouette, the dress drew immediate comparisons with Grace Kelly’s 1956 wedding gown, particularly as the cameras lingered on its slender lace sleeves as Kate travelled to Westminster Abbey in the deep windowed old Rolls Royce. British craftsmanship was intentionally placed at the heart of the design, with all fabrics save for the French Chantilly lace sourced and supplied by British companies. The corseted bodice and full skirt both featured lace applique which was handmade by the Royal School of Needlework at Hampton Court Palace, meaning that the dress was not wholly made within the grounds of Buckingham Place as was initially suggested. The RSN workers assisted the McQueen team in combining French Chantilly lace with English Cluny lace using the Carrickmacross lace-making process, which originated in Ireland in the 1820s. So delicate was the sewing that the workers were required to wash their hands every 30 minutes to keep the lace and threads pristine, while the needles were renewed every three hours to keep them sharp and clean. After the ceremony, Prince William judiciously put on his white gloves before he handled the dress as he helped Kate into the carriage when the couple left the Abbey. The narrow ivory satin bodice, narrowed at the waist and padded at the waist, is a classic McQueen look. The back of the dress featured some 58 buttons – a detail echoed at the back of Pippa Middleton’s bridesmaid’s dress, which was also designed by Burton and the McQueen team. In a statement yesterday, Burton acknowledged it had been “an incredible experience for my team and I, as we have worked closely with Catherine to create this dress under conditions of the strictest secrecy.